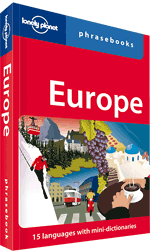 More powerful than a fistful of euros, reaching further than a Eurailpass, this phrasebook is more entertaining than Eurovision! From the Mediterranean to Scandinavia, Turkey to Sweden, this is your ticket to 15 languages, a whole continent of culture, and the ultimate European adventure. This is the definitive European phrasebook. This phrasebook covers: Bulgarian, Croatian, Czech, French, German, Greek, Hungarian, Italian, Polish, Portuguese, Romanian, Russian, Spanish Swedish and Turkish.